Hemangini was a young teen when she lost her mother due to medical malpractice. Since then, she took over her mother’s role in running the household and continued her schooling. When she graduated high school, Hemangini worked to sustain her family and cover her younger brother's education. She also started taking evening courses in fashion design at the National Institute of Fashion Technology (NIFT) and finished her certification. With a relentless zeal to succeed and with the dream to give her family a better life, she took a one lakh rupee loan from Dreams and started her own fashion label, AABHLO. Hemangini balances a day job with fashion designing and dreams of her label growing big someday soon. Lalita behn has been a rag picker for many years. Maheshbhai, her husband, lost his arm in an accident. They both work hard to feed their family which includes three children. But the rental for a pedal rickshaw is Rs.30-40 a day. This amounts to about 1000 rupees a month or one lakh in ten years - for a pedal rickshaw that costs just Rs.9000! 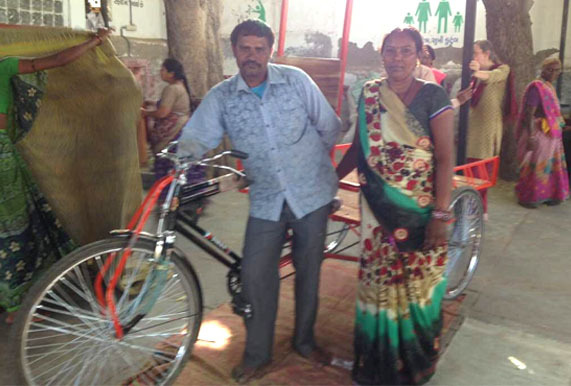 With the help of Dreams Foundation, Lalita behn and Maheshbhai invested in their own pedal rickshaw. This freed up funds for them to help support their family. Infact, Dreams is distributing modified and good-quality pedal-rickshaws to deserving people. The beneficiary will pay Rs.30- Rs.40 a day initially. In less than one year, he/she will own the vehicle. We hope to give 500 pedal-rickshaws within the next two or three years. A gift that will change the life of many hardworking and needy families instantly. JAGRUTI is a 23-year old mother who has a knack for design and intricate craftsmanship. She started Jiya Accessories, a small jeweler manufacturing enterprise with a seed capital from Dreams of just one lakh rupees. Today, Jiya Accessories employs 25 home- based workers and has enabled JagruH and her husband to buy their own home and enroll their daughter in a beIer school. JagruH hopes to provide a good life for her daughter and her family. KHUSHBOO is a bright girl who grew up in a very simple, hard-working family. Her mom is a tailor and her dad works as an oﬃce-boy. Khushboo, through her own initiative, started learning computer skills as she was going to college. With a loan of 29,000 rupees from Dreams, she bought a laptop, which helped her earn additional income through data entry jobs. In two years, she mastered enough computer skills and so>ware to become a computer teacher at Manav Sadhna. During this time, she became familiar with accounting so>ware and has moved on to complete her post-graduate degree in accounting. She has taken up an accounting job at a university. The laptop empowered Khushboo to follow her dreams. She plans to repay the entire loan as soon as she saves enough money. MAYABHAI is a leather artisan based in Rapar, Kutch.He has changed the conventional methods of his craft by creating innovative designs according to the current demands. When he gets orders for products, he is able to employ 30 women in his locality. With the seed money of 50,000 rupees from Dreams, he invested in the raw materials required to create an inventory of slippers and bags to sell at exhibitions. He is no longer solely dependent on orders, which means he can earn more regularly. In addition to providing livelihood in his community, he can now aﬀord his daughter’s higher education, so that she may pursue her own interests. From his earnings he will be able to continue investing in a material bank.